Rob Kiser|Miami Valley Today Photo Piqua pitcher Owen Toopes fires a strike to the plate Monday against Sidney. 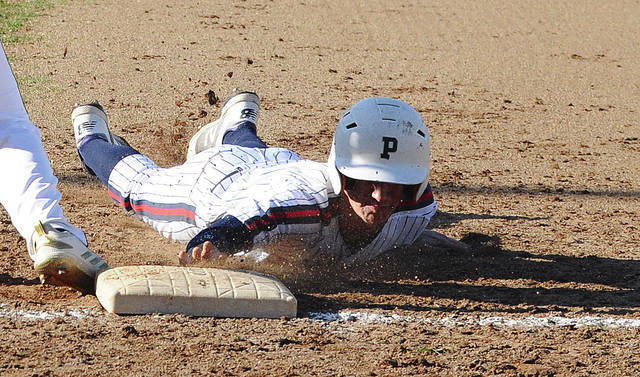 Rob Kiser|Miami Valley Today Photo Piqua’s Cameron Deal dives back into first base safely on a pickoff attempt. Rob Kiser|Miami Valley Today Photo Piqua third baseman Mick Karn goes airborn to throw out a Sidney base runner Monday at Harman Field. The Piqua baseball team is doing all the right things. The Indians picked up their fourth straight win Monday night at Hardman Field in impressive fashion. Piqua jumped out to a seven-run lead in the opening inning and went on to a 12-1 win in GWOC American action. The Indians improve to 6-5 overall and 4-3 in GWOC American play, while the Yellow Jackets dropped to 4-8 overall and 2-6 in GWOC American play. The two teams were scheduled to do it again Tuesday at Sidney High School. “We are playing really well as a group right now,” Piqua coach Brad Lavey said. Piqua scored seven runs in the opening inning off Trey Werntz, sending 12 batters to the plate. The first three runs came before Piqua had a hit. Piqua pitcher Owen Toopes started things with a walk. Zack Lavey put down a bunt and was safe on a throwing error. Mick Karn reached on a fielder’s choice, scoring Toopes. Karn scored when Zane Beougher reached on an error and Iverson Ventura’s sacrifice fly scored Beougher. Piqua then scored four more runs after two were out. Cameron Deal walked and Ethan Pohlschneider singled. Dylan Motter looped a two-run single into rightfield. After Blane Ouhl walked and Toopes was hit by a pitch, Lavey had a two-run single up the middle to make it 7-0. Werntz kept Piqua off the board in the second and third, but the Indians added five more runs in the fourth. Karn walked, stole second and scored on Beougher’s RBI single. Beougher would eventually score on a wild pitch. After Darius Boeke took over on the mound for Sidney, Ventura singled and with one out, both Pohlschneider and Motter walked. Ouhl lined a ball into rightfield for a single and went to second when the ball got past the rightfielder, with two runs scoring on the play. Toopes had a fielder’s choice capping Piqua’s scoring. “We really did a nice job all the way through the lineup,” Lavey said. That was more than enough support for Toopes, who pitched a two-hitter and only allowed three Sidney baserunners. In the third, EJ Davis and Carson Taylor singled and Davis scored on Mitch Larger’s sacrifice fly. Davis was hit by a pitch in the fifth, but Toopes stranded him on second base. Piqua defense turned in several web gems as well. In the second inning, Karn fielded a slow roller at third base and went airborn to throw the runner out, while Deal chased down a long fly ball in the top of the fifth in leftfield. Toopes struck out four and hit one batter. Werntz and Boeke combined on a six-hitter, striking out one, walking eight and hitting one batter. On Tuesday, Piqua headed to Sidney looking to complete the series sweep and continue its momentum. 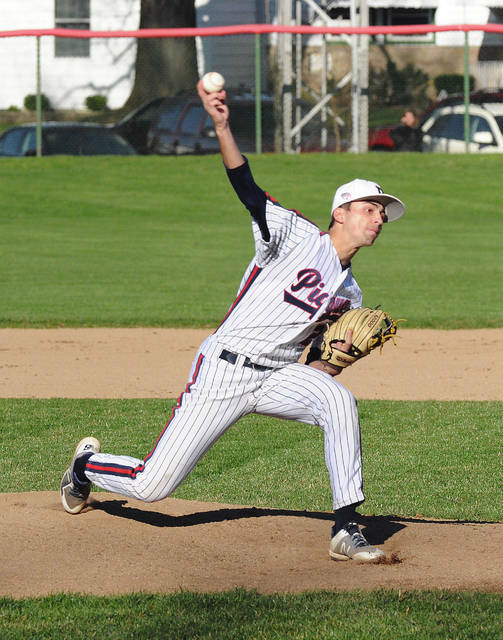 https://www.dailycall.com/wp-content/uploads/sites/30/2019/04/web1_owentoopes.jpgRob Kiser|Miami Valley Today Photo Piqua pitcher Owen Toopes fires a strike to the plate Monday against Sidney. 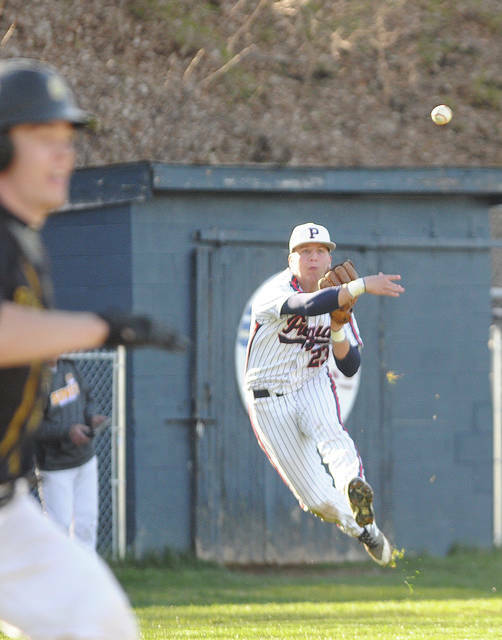 https://www.dailycall.com/wp-content/uploads/sites/30/2019/04/web1_camerondeal.jpgRob Kiser|Miami Valley Today Photo Piqua’s Cameron Deal dives back into first base safely on a pickoff attempt. https://www.dailycall.com/wp-content/uploads/sites/30/2019/04/web1_mickkarn.jpgRob Kiser|Miami Valley Today Photo Piqua third baseman Mick Karn goes airborn to throw out a Sidney base runner Monday at Harman Field.